Members of the Jaguars pose in front of Parker Hall in 1965. From left: Bill Meeker, Jim Labit, Jack McAlister, Don Bowman and Don Copeland. 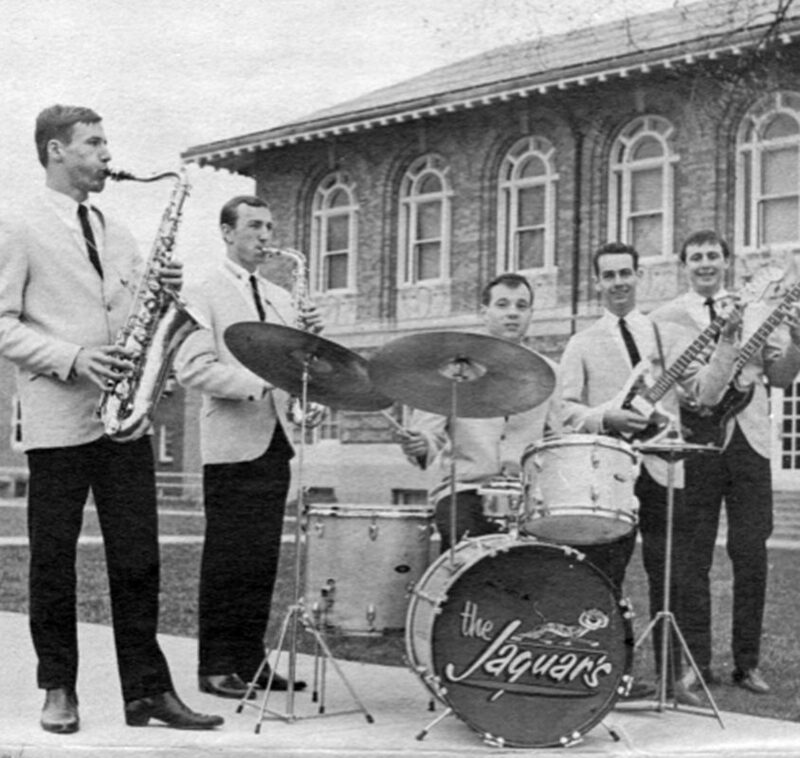 When students on the Missouri S&T campus in the 1960s weren’t listening to class lectures or lab recitations, their thoughts turned to music, and part of their soundtrack came from a student band called the Jaguars. Formed in 1964, the Jaguars were a group of students from S&T, Rolla High School and Dixon High School. After winning the “Campus Talent 1966” competition the group went on to provide party music for a decade’s worth of Miners. “We were fortunate that we got connected among the fraternities and the eating clubs,” says guitarist Dean Park, a 1972 S&T electrical engineering graduate. “We were a ‘first-call’ band. There were times that we were playing six nights a week and two shows on Sunday.” They even performed for recruits slogging through U.S. Army basic training at nearby Fort Leonard Wood before being shipped off to Vietnam. By 1969, times were changing and so was the band. The musicians regularly hung out in band member Chuck Miller’s house near campus. Soon they began kicking around the idea of a new band name and Miller’s Cave was born. The band’s hairstyles and stage attire also changed. Gone were the Jaguars’ clean-cut hairstyles and matching grey three-button suit jackets with black ties. Miller’s Cave members sported shaggy hair, mutton-chop sideburns and the more casual stage dress of the bands whose music they played: Sam and Dave, The Spencer Davis Group and most other pop groups of the late ‘60s. Arriving on campus in January 1969, Hugh Cole, a 1972 S&T engineering management graduate, wanted to be the first in his family to earn a college degree. Needing money, Cole tried out for Miller’s Cave. “They were looking for a trumpet player who could also sing,” Cole says. Cole knew Miller’s Cave was having a campus impact after performing a song called Soul Shake by Delaney and Bonnie at a fraternity gig. “We could tell who had been at the party because people on campus were walking around on Monday humming the song and saying, ‘Oh, you’re in Miller’s Cave. Wow, that was a great song,” Cole says. Every college band has a legacy story. The Miller’s Cave story happened during a St. Pat’s weekend in the early ‘70s in the basement of the Pi Kappa Alpha fraternity house. “One of our pieces of shtick toward the end of the night was to form a chorus line,” Park recalls. “The floor was a little bit sticky. You could handle the sticky but not the slick. Someone slipped and we went down together. Herb (Smith, a 1972 aerospace engineering graduate who earned a Ph.D. in mechanical engineering in 1979) had a pint bottle of some concoction in his back pocket that punctured his pants. After they graduated, band members scattered across the country, started successful careers, married and raised children and grandchildren. Some performed music as solo acts or at church. Miller’s Cave disbanded in 1972. It was the end of an era. Then a couple of years ago, what started as a suggestion to recreate a 1971 band photo turned into a plan to get the band back together. Soon instrument cases were dusted off and 70-year-old fingers limbered up to play as a band for the first time in nearly 50 years. In March 2017, while other Miner alumni celebrated St. Pat’s, Cole, Park and Smith were joined for a two-day jam session by eight other musicians who had played in the bands. Among them were drummer Dale Walterman, a 1971 engineering management graduate; trumpeter Chuck Miller, who earned bachelor’s and master’s degrees in civil engineering in 1968 and 1970, respectively; saxophonists Bill Meeker, a 1968 mechanical engineering graduate, and Gerry Hart, a 1971 engineering management gradaute; keyboardists Dave Trost, a 1972 English graduate, and Lee Testorff, who earned a bachelor’s degree in physics in 1969; and guitarists Jim Labit, a 1969 mechanical engineering graduate, and Don Bowman, who graduated from Missouri State University in 1976. “Whenever we met last night, it was like we knew each other for our whole lives,” Cole said of the group during a break the next afternoon. Fast forward to May 2018 and the group, now called JMC50 in a nod to both bands, perform for a hundred or so alumni and their spouses during the Golden Alumni Banquet. Many heard the band play these same tunes half a century earlier. A couple of members have yielded to new technology, housing their sheet music on iPads. Miller and Cole use a chromatic tuner app on a smartphone to dial in the tune of their trumpets. But their music stays the same. Cole says the group hopes to perform at the Golden Alumni Reunion each May as band members return to campus. Watch JMC50's full concert video. Another unique success story from Rolla. Indeed many students struggled back then to afford college. This brings back memories, too. Bill Meeker ’68 was the older brother of my best pal Bob Meeker from North KC HIgh. Bill gave me a lot of pointers for how to survive Rolla that really helped, and I often wondered about him as I saw he had become a Math teacher- a great one I expect. The 60’s were a tough time for most of us students and this is a wonderful report card on the musicians. Hi David. Thanks for the kind words. I enjoyed two careers after Rolla, flying for the Air Force and then teaching but not much in terms of playing music, until now at least. Maybe we can play for your 50th! Great & glad we attended! Loved it..would recommend sending link out on email to all who attended. Hard to believe, but many are not on FaceBook.. Recommending to younger alumni to attend their 50th! Thanks for great planning and execution of entire event. Hello David and Jim! Thanks for posting those comments! Our thanks to Terry Barner of Missouri S&T for his awesome effort at putting this article and producing the embedded videos! JMC50 will play at the Class of ’69 Golden Reunion in May ’19 – and we’re looking forward to having as much fun as we did last May. We just had a gig at my 50th high school reunion in STL, and have had a couple of nice fundraisers in Houston! We are really enjoying this re-incarnation of the Rolla days. And Jim, you’re right about the struggles to afford college back in those days! Not sure how we would have made it without the Jaguars and Miller’s Cave. If any Alumni want to get (or stay) in touch, our Facebook page is http://www.facebook.com/jmc50band!